A typical lagoon near Cancun, Mexico. THE DRIVE to the dock at Laguna Manati is only 25 minutes from the unbridled excess that is Cancun, yet upon arrival it feels a million miles away. The road has finally shed its pavement and ends in the familiar plastic chairs and Cerveza Sol canopy of a real country joint. Instinctively I know that the day will end not with the last cast, but with a bowl of ceviche and cold beer. A dozen or so ibises grumble at each other in the mangroves behind the little restaurant, and then fly off above a line of pangas, all of which are sloughing paint. Two have makeshift poling platforms, giving them a mild air of insolence that seems to say, “Hewes skiff? I don’t need your stinking Hewes skiff.” It’s 6:20 A.M., and the tranquil lagoon behind the pangas is punctuated by a rolling fish. I could find no coffee this morning, but suddenly I have no need of it. My guide for the terra firma part of this morning’s trip was Christian, a skinny and sweet kid who insists on hauling my gear as he points out a short, stocky guy in a ratty baseball cap. “He will be your guide. He is Enrique. He is my father.” For some reason, this gives me additional confidence in my guide-to-be. Papa Enrique gives me an easy grin, followed by an “Hola amigo. What you like today? A grand slam?” I like him right away, but my laughter is largely rooted in the absurdity of his comment. Grand slam. Yeah, right. There is nothing quite like the first few moments of a boat ride to a day of fishing. All the pre-trip angst — the poor sleep, the fretting over what you forgot, the fifteenth reading of yet another article that tells you just how to do it right (not like the last one you read, do it like THIS now!) — they all melt away into a unique cocktail of relief and anticipation. Suddenly you are not worried. We cut a soft wake through the mist above the lagoon to a narrow gap in the mangroves on the northern end, where Enrique responded to the suddenly narrow passage by cranking up the speed. It was here I learned the first of many lessons to come over the next two days: when in mangrove tunnels, pay attention. A stray aerial root to the head does wonders for instantly ending any philosophical reveries. Out of the mangroves, and into a vast bay that seems like it must be lousy with great flats. But we skip that one, and the next, and the next, each with even clearer water than the one before. I feel the first insidious pangs of impatience — my god, why aren’t we stopping at this one? When we finally do stop, I nearly run off the front of the boat before making my first cast to correctly stack the line behind me. It turns out this is hard to do when your merkin sticks in your pant leg. Attempt number two is reasonably successful, and I am finally ready. Of course, a part of me expects to see fish immediately, but I’ve had a few of these days now, so I try to settle in to the rhythm of scanning and waiting. So when after only 20 poles or so, Enrique says, “I see nervous water. Permit, one o’clock, 100 feet,” I feel like an athlete suddenly deprived of his warmup period. Christ, he’s right, they are permit, six of them, black tails and all. I am very aware of those tails, you see, because with my cast I manage to pretty much hit one of them. On to the next flat. So there are. The next one is joy-riding a ray, and I manage to put the cast just so. This cast appears to defy two laws of physics. First, that I managed it so deftly. Second, the old maxim about actions and equal and opposite reactions. For in response to my oh-so-lovely cast, the ray does not a damn thing, but the permit acts like I just lobbed an F150 into the water, and leaves in what I find to be a most unnecessary and overly dramatic rooster-tail. Ah, who cares, it was a good cast. And so is the next one I make to pack of junior-high permit, who ignore the fly just like it was one of their parents. The next flat brings a respite from tilting at scythe-finned windmills. This time, Enrique says “bonefish, twelve o’clock, sixty feet.” Funny how a change in perspective can change everything — there was a day when the bonefish call turned me into a stumbling idiot on the casting deck, but now, on the heels of the permit humiliations, they seem almost ordinary, and my cast slows down, my loop stays tight, and three strips later the fish bolts for the channel as my reel finally finds a purpose in the day. Perhaps sensing that I need a different sort of therapy at the moment, Enrique suggests we hit the mangroves and hunt for tarpon. OK by me. Finally, it happens, and I’m shocked to discover it is exactly as described in everything I’ve ever read for.well, decades now. I set the hook, there is a brief moment of prescient electricity in my hand, and sure enough, the little tarpon heads straight for the sky. For once, I know what to do, and bow. It is a moment I will not soon forget. The gills really do rattle, the scales really are huge and glimmer in the sun, and the whole thing is framed by not only by my bow to the fish who has already made my trip, regardless of whatever else does or does not happen, but also by dozens of bows from the little pink derricks in the background. Lunch time. Two cold Cokes, a ham and cheese, and then Enrique convinces me to leave the lagoon and take a shot at the slam. Lots of permit on the flats this afternoon, he says. Uh-oh. Back to the nuthouse. But I find the afternoon has a different tempo. The permit are there, including one monster who gives my fly the twenty-five point inspection before ambling off without it, and yet I am no longer a wreck. My casts are getting better, and I care less when they still inevitably fail from time to time. And, though Enrique seems to exude confidence that we will boat a permit, I’ve read way too much to really believe that. Besides, I already had my first tarpon. More would somehow cheapen it. So when he says, “OK, reel in, we head back now,” I am not in the least disappointed. Although, when we have that beer and he says, “tomorrow, we catch a permit!,” I so, so want to believe him. We leave even earlier, and Christian joins us. When I ask him if he is also a guide, he squints into the morning sun and says, “Someday, I hope to be. There is much to learn.” I stare at him and think of my own teenage years, when I was sure there was nothing more for me to learn. This kid feels fishy, and I mean in a good way. I give him my extra pair of polarized glasses. 7:30, and we are already poling our first flat, nervous water in our sights. At eighty feet, a black tail splits the surface, followed by two more. They submerge, the wake begins again, and then there they are, at least a dozen of them, and I make my first cast of the day. By now, I know to strip the little crab, even though most of what I read drilled into me to let the damn thing be. Enrique wasted no time the day before disabusing me of that notion. So I streep it, and three fish peel out of the school and charge the fly. Oh my god, here it comes, I’m actually going to catch one of these. Or not. They don’t seem to spook, but abandon the fly in favor of their buddies and off they go. Dammit. Breathe. “They come back. Wait. Wait. Cast! Cast now!” Still caught up in the excitement of the near-miss, I cast like I think I’m Nolan Ryan and a pile of line lands thirty feet from the boat. The permit are not amused. We cross a small channel, and begin a slow pole down the next flat. This one is straight out of a TV show — a perfect sand bottom, light wind, ideal lighting — if you can’t spot fish on this flat, you can’t spot fish in an aquarium. We run it once, and no luck, but for the only time of the trip, Enrique decides to re-run a flat right away, so back we go, and after a few poles, there they are. There are six in this school, we are broadside to them, and they are moving towards us at about a 45-degree angle. I make the cast, and as I let it go, they change course and speed up a little, and the cast lands a few feet behind the school. I strip in a bit, make one long false cast, and let it go. Unaccountably, the little crab lands three feet in front of the school, and I’ve barely begun to strip before I feel the weight of the fish, see the rooster tail that punctuates his run for the channel, and hear the whine of the reel. In no time, the backing knots click through the guides. Fifteen minutes later, I hold him in my hands, and all I can say to Enrique is “thank you.” I twist out the merkin, bite the line, permanently retire the fly to my hat, then jump out of the boat still clutching my first permit. There I am, in soft Yucatan silt up to my knees, one hand around the tail and the other gently beneath him, rocking this beautiful fish back and forth. With each pass I can feel his strength returning, first as little pulses along the side, and then as subtle waves of the tail with each forward push. A few more, and he is off. I follow him until he is out of sight, and then simply sit down in the water, sinking into the muck, a stupid grin on my face. “So happy!” Christian says. Enrique just laughs. We sit in the boat at that flat for a good twenty minutes, sipping drinks, watching birds, and saying nothing. Enrique does not suggest we leave, and I do not ask. We simply soak in the morning. Long ago, I read a novel that discussed how something could not be “more perfect”, perfect being a word that by definition could not be embellished. The novel then went on to describe a situation as more perfect. So were those twenty minutes. Ah, but one cannot wax rhapsodic for too long in the Yucatan, or one will get beaned by a mangrove. So off we went on a long trip to another flat, this one full of eel grass. Thirty minutes of poling brought no signs of life, but then a ray appeared, a second, and then a third that was flanked by a big permit. I broke out the old “hit him on the tail” cast again with predictable results, but hell, who cares? I just caught a permit. It’s not going to happen again no matter what I do. But then it did. Along came another school, this one suddenly at the boat no more than 25 feet out, I snap a cast and he’s on, the whole thing played out in technicolor right in front of me. 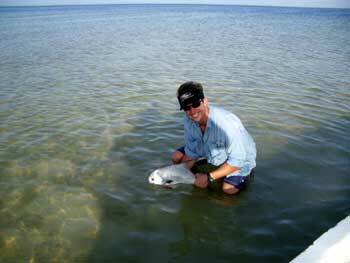 More backing, a tense moment with a mangrove seedling, and then my second permit is in the boat. I release him, we keep going, a single permit appears sixty feet out at twelve, I cast, and I catch him. I am, needless to say, completely shocked and speechless by this point. It is only 10:30, and I’ve caught three permit. I scan the skies in expectation of cats and dogs falling from the building thunderheads. “Bonefish time amigo!” So off we go to a large and very shallow flat, one that requires us to get out of the boat at one point and push it a couple hundred yards through the muck. It feels good to get in the water and work hard for a minute; the effort begins to break through my stunned state of mind. Back in the boat, I blow a couple of shots at small schools of bonefish, and then manage to hook a good one. With no channel in sight, this fish shows me a disturbing amount of my backing. Twelve noon, and a tarpon shy. I didn’t even need to ask Enrique what we were doing next. Unlike the day before, we stayed in the smaller mangrove channels, snaking through tortuous little paths like some sort of piscine patrol boat. The way the day had gone so far, I expected to see a tarpon under every branch, but an hour later, we’d jumped only two, neither of them good shots. Time was running short. I began to counsel myself not to care, and not to let some silly goal re-define a lifetime day. And then, sure enough, the moment I begin to let go, it happens. We squeeze through a tangle that requires Christian and I to hit the floor of the panga, and emerge into a short open stretch just in time to see the tarpon roll. I cast as I’m getting off the floor of the boat, and suddenly I’m trying to keep a silver contortionist out of the mangroves that surround us. Seeing the odds are looking grim, Christian grabs the net well before the tarpon has begun to tire, and as the fish makes another rush past the boat, I switch directions on him hard, Christian pounces with the net, and it is done. Technically, we have another 40 minutes or so on the clock, but I tell Enrique to head for the docks. When things are more than perfect for the second time in one day, it’s time to go home.